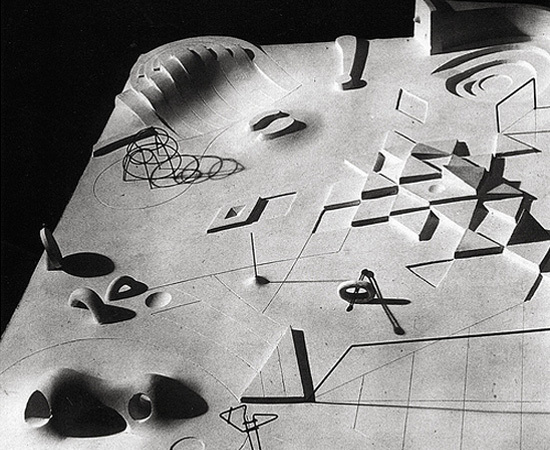 Andrew Raimist, of Architectural Ruminations, has uploaded some terrific images of Isamu Noguchi's unbuilt UN playground to his Flickr account here. A UN playground is anything but for children and innocent play, it would seem. 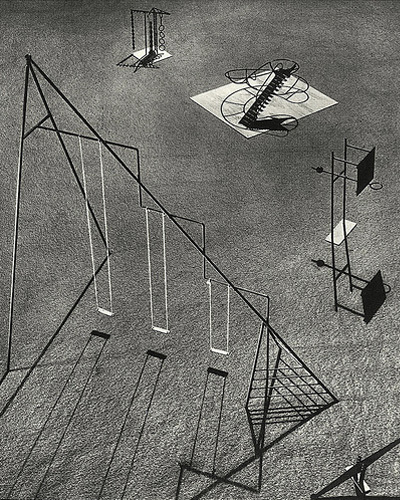 And Raimist has also uploaded a photo showing models of Giacomettian playground equipments, again designed by Noguchi. Devoid of any humans, it looks like a surrealist tableau, as desolate and unnerving as a de Chirico landscape. One wonders, then, if Noguchi intended his playgrounds to be the perfect environment to rear sophisticated aesthetes and connoisseurs of world culture. Or did he secretly scheme to turn the children of UN diplomats into psychopaths? Is the UN playground a “rabbit warren” for budding dictators? “Post-war Modernist landscapes turned me into a despot,” they would say during trials at the International Criminal Court. Meanwhile, there are also images of another unbuilt project, the Memorial to the Dead of Hiroshima, which Raimist discusses in three excellent posts. Go see. For these and other projects, it's best to buy Isamu Noguchi: A Study of Space by Ana Maria Torres. Thank you very much for reposting these images and providing links to the Giacometti and de Chirico references. While I studied de Chirico's paintings with respect to their surreal architectural imagery many years ago, I'm only now beginning to learn more about Giacometti's Palace at 4 a.m. and similar works. Do you know of good sources for material on those stick-built, cage-like sculpture's that seem to have made a tremendous impact at the time? I'm presently reading Rosalind Krauss' book Passages in Modern Sculpture discussing that work. 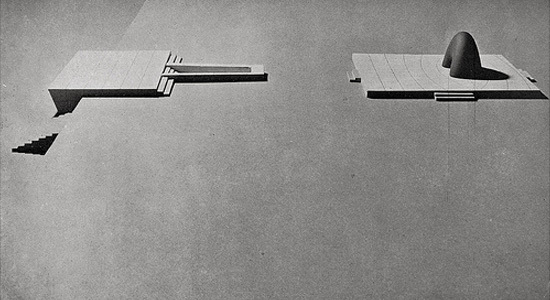 I'm very interested in the manner in which Noguchi used models of sculptural environments and small sculptural tableaus referencing the real world at a smaller scale. I'm working to try to understand the process Noguchi used in developing these ideas in model form and then worked to have them realized full-scale. 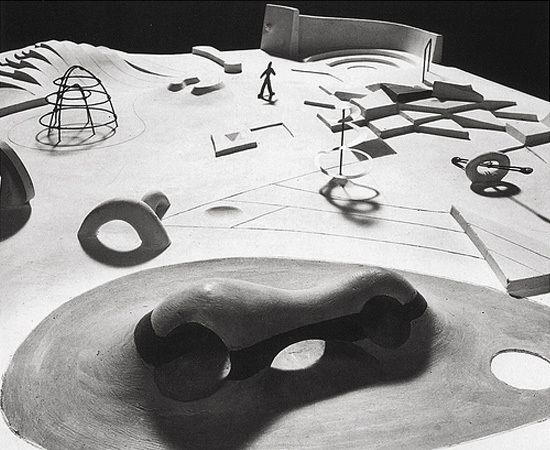 My interest stems from Noguchi's Lunar Landscape of 1946-47 located in Harris Armstrong's Magic Chef Building, Saint Louis, Missouri.